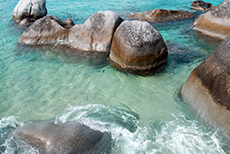 Swim or bask in the sun amid mammoth boulders in this unique atmosphere of palms, sand and sea caves. Boat transportation was late to pick us up. Battered by storm but still beautiful beach and caves. 2nd time here, love the Baths, but beware of tours coming off big tour ships. Well worth taking cruiseship excursion.